I just started visiting the X links. I will be catching up over the next week...but I have NOT forgotten you. I experienced a glitch with Linky with the very first entry on this week's meme ("Your pooch a movie star?") since there's NO link! My second attempt (#3 on Linky) was fine. Would be most grateful if you could delete #1 entry as nobody can access it! Many thanks for hosting this great meme! I enjoy visiting you all the time Ms Jenny. Hope you stop by early this week so you can enter my giveaway! Thanks for hosting this meme each week. I do love it! Nice to the next to last, Jenny. 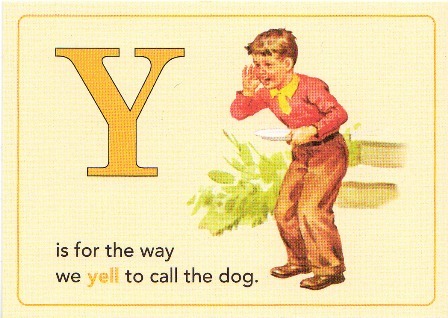 I hope you do't have to "Yell" at your dog too much. Our dog, though, needs yelling at because she is hard of hearing. Yipes, can it be we're near the end of the A-B-Cs so soon? Why, yes we are indeed or at least we're very near the end. Thanks for yet again hosting another week of Alphabe-Thursday, Miss Jenny. I say, "Yahoo, let's get another round on when this is all said and done, don't you?" YES! It's me, on time this week! YikES! I'm still in my Jammies! I am making up last weeks assignment and adding Y too! Love your signs! Love you bunches Ms. Jenny!